* this post is part of the january synchroblog, which is centered on new beginnings. i have loved partaking in the practice of “one word” for the past few years; even though i am one of those people who starts out strong and loses steam by about april, i appreciate the intention and love hearing other people’s words and hope for new beginnings, too! at the bottom of this post is a link list of other bloggers writing on the same topic. last year i was part of a life-coaching group to gain some traction in a few areas of my life, and it was so helpful in more ways than i probably even know. one part that i loved was that we started with an image that reflected our hope for the year. not a word, an image. i had done words in different ways for years before but never an image. i thought about it for a long time and it was interesting what came–a river. i am a water person and my go-to imagery is usually the beach or a lake, but i couldn’t shake that the image that i needed for 2013 was a river. rivers describe my life much more than a beach or a lake. always moving. got to roll with it. resisting it won’t work. moments of rest & stillness. 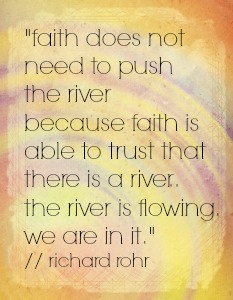 leaning into it and going with the flow. strong. intentional. peaceful in a weird, paradoxical way. phrases like “you can’t push the river” and “peace like a river attendeth my way” and “i will extend peace to her like a river” and yes, even the creedence clearwater song “rolling like the river” lingered all year long. i printed this picture and kept the imagery in front of me as best i could. recently a friend of mine who is a firefighter and water rescue diver told me three interesting things about rivers from their training–they are powerful, they are relentless, and they are predictable. i have been meditating on those since he shared them, especially the “predictable” one because life doesn’t feel very predictable on the surface. but when i take a little deeper look at it, there are parts of life that are known, that i can count on. it made me think of something a friend shared last month at our house of refuge. they are from a book called the five things we cannot change and the happiness we find by embracing them by david richo. these truths are easy to respond to with “of course!” but the reality is that i so often resist them in different ways. even though rivers are powerful & relentless, they are also predictable. and i can count on these realities of life to show up over and over again. resisting them won’t help, embracing them will. so instead of picking a word for 2014 or even a new image for 2014, i decided my new beginning was to just stick with this one for a longer period of time because i think there’s much more i need to learn from it in this wild year that lies ahead. if you’ve got an image, i’d love to know what it is! ps: on a totally different topic, i’ve got a post up at my friend phil shepherd’s blog on patheos called dignified dialogue. i’ve written about that here before, but this is a little summary of not just the 5 guidelines but some other questions we can explore in these hard conversations, too. My image – home, my real home, not the home on this side of the curtain. We do indeed dwell in the shadowlands, where we journey together. It’s weird and often confusing, but temporary. The only thing that makes any sense is loving and helping each other in this veil of tears. What you are writing is helping me to be cognizant of compassionate image meditation. For me – it helps to meditate on a lady who prays in the church and what it is like to experience her laying on of hands and praying. It conjours up an image, and also emotions, relations, connection, belonging, peace, love. 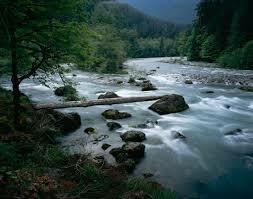 I loved your post mainly because the river has been my image for a very long time. I can’t get away from it and I don’t want to because it keeps morphing into a significant message from God. I wrote about my first experience with the river for Ed’s Hazardous syncroblog (http://storyinthemiddle.blogspot.com/2012/08/hazardous-following-is-flowing.html). Then I had a second encounter with God at a more peaceful river setting where he led me into a period of resting like a river rock at the bottom of a gentle flow. It came from reading Psalm 46:4 and the 46:10 when I heard this question: “Harriet, if you never do anything with the rest of your life, do you believe that you still make My Heart glad?” Out of this encounter I painted the piece shown in the blogpost. The tree is a secondary but parallel image from an earlier time that was resurrected. It came from Psalm 1. The two images together represent two movements of flowing and rooting that I try to keep in tension.